When a plethora of Three Lions memes began to do the rounds on social media, the ugly rift which has always undermined “the beautiful game” began to re-emerge. 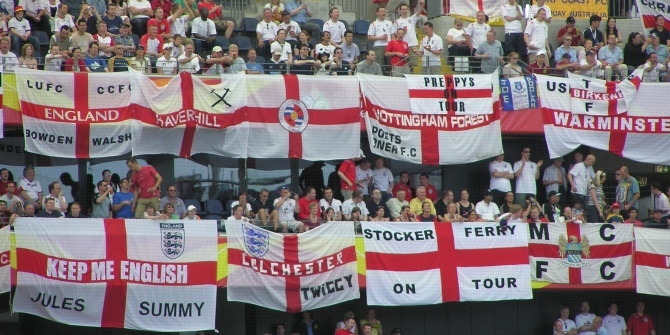 In England, football is the most contentious sport of all. As millions of fans took to the streets in elation, the English mass media did what they have always done – demonise the working class. Twenty-nine years on, it’s obvious that the hard lessons learned from Hillsborough mean very little to those in positions of power. The 2018 World Cup couldn’t have come a better time for the English. There is only so much political uncertainty a small nation can take – with Brexit, Snap Elections, Windrush and consecutive cabinet resignations, the nation’s political turmoil is a miserable and seemingly never ending spectacle. But the performance of the young England squad proved a pleasant surprise for the permanent residents of May’s Inferno – the long suffering public who have lost all hope. The team exceeded expectations and gave fans, for the first time in a disappointing history of national football, a chance at happiness in solidarity with their fellow countrymen. After Brexit, a lot of us had forgotten what it felt like to celebrate a national event down at the pub. Indeed, following the Tunisia game, turnout in city centres and highstreets seemed to boom. Crowds gathered, chanted forgotten songs and wore silly hats. People laughed and danced in the street. The sun was out too, for once, and most of us conceded that life was (eerily) good. Football’s imagined homecoming provided us all with a much needed escapism from a bleak, political reality. In recent years, academia has seemingly forgotten that England is a country plagued by deeper rifts than Brexit. It might seem difficult for intellectual elites to comprehend, but Brexit is symptomatic of much more than “little Englander” nationalism arising from a colonial superiority complex and, of course, staggering rates of monolingualism (The Economist, 2006). Rather, there is another causal factor which is seemingly overlooked – decades of class prejudice and the relentless oppression of the English working class. Such is the ugly rift which rears its head whenever “football mania” is deemed to have struck the masses. As such, it didn’t take long for working class fans to receive their usual share of middle class scorn. After the Sweden game, the coverage of the World Cup took a sour turn. Videos of fans jumping on an ambulance and bouncing on a bed in an IKEA went viral. Thereafter, social media transformed into a lynch mob which collectively cried out for the police to enact their powers. Then came the usual, toxic framing as the mass media dusted off one of its prize folk devils (Cohen 1972) – the “football hooligan”. 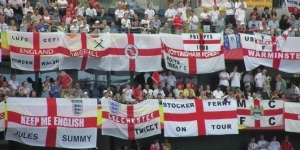 The small group of rowdy fans, who had been carried away by the contagion of an understandably euphoric crowd, became representative of all England supporters. Indeed, mindless “football hooligans” were inducing national shame, whilst the respectable at Wimbledon enjoyed strawberries with cream. What might this tell us? Sadly, that nothing has changed. The World Cup coverage was little more than the re-working of a banal old adage, “Football is a gentleman’s game played by hooligans, and rugby is a hooligan’s game played by gentlemen” (via Health24, 2015). Those who are eager to readily dismiss such rhetoric as petty need to be reminded of the toxicity of the context. Discourse always implies action, and the “football hooligan” jibe is a prominent example of this; in 1989, classist attitudes towards football fans in Thatcher’s Britain saw the cover-up of a policing disaster at Hillsborough Stadium. In 2017, twenty-eight years on from Hillsborough, the case reached a feeble conclusion when six individuals were eventually “brought to justice”. Indeed, the outcome of a similar disaster effecting the respectable – perhaps at a Rugby match – doesn’t leave much to the imagination. And for all the chattering of the progressive class, following the conclusion of Hillsborough, there has been little change enacted. It is no surprise, therefore, that during the 2018 World Cup it was business as usual in England. Namely, because class power is maintained through continuous, tacit acts of symbolic violence against the people. As Bourdieu (1979:83) observes, symbolic power is that which “makes it possible to transfigure relations of force by getting the violence they objectively contain misrecognized/recognized”. In this context, one needs to look no further than the media lynch mob (online or otherwise) calling for violence; that is, the sanctioning and mass policing of “rowdy” football fans across the nation. The prolific reporting of the actions of a small group of fans, when an estimated 26 million viewers followed the England squad through their World Cup journey (via ChronicleLive, 2018), demonstrates the resilience of the mass media in their most cherished hobby – the pursuit of class warfare. During the 2018 World Cup, those in positions of influence utilised their power to pedal the same overtly classed rhetoric which caused devastation at Hillsborough twenty-nine years ago. Try as we might to jovially anticipate footballs’ homecoming, we might also benefit from acknowledging a bitter truth – our beloved game is better off elsewhere. Bourdieu, P., (1979) ‘Symbolic Power’, Critique of Anthropology 4: 77-85. Cohen, S. (1972). Folk Devils and Moral Panics: The Creation of the Mods and Rockers, London:Routledge. Health24., (2015) ‘Is rugby ‘a hooligan’s game played by gentlemen’?’ [Online]. Available at https://www.health24.com/Columnists/Is-rugby-a-hooligans-game-played-by-gentlemen-20150928 (Accessed 17th July 2018). Johnson, I., (2018) ‘World Cup 2018 viewing figures – how many people watched England’s heartbreaking semi-final defeat’, ChronicleLive [Online]. Available at https://www.chroniclelive.co.uk/news/tv/world-cup-2018-viewing-figures-14900170 (Accessed 17th July 2018). The Economist., (2006) ‘Monolingual Britain: They all speak English’ [Online]. Available at https://www.economist.com/britain/2006/12/13/they-all-speak-english (Accessed 17th July 2018). Lucy Smith (@SmithLu_x) graduated from the BSc Sociology programme this year. Her interests include STS (Science and Technology Studies), the Sociology of Knowledge and Education, Social Theory (Contemporary and Classical), Continental Philosophy and the Philosophy of Social Science.